Giant knotweed is an herbaceous perennial, strongly rhizomatous, growing over 12 feet tall. It has huge elephant-ear shaped leaves. 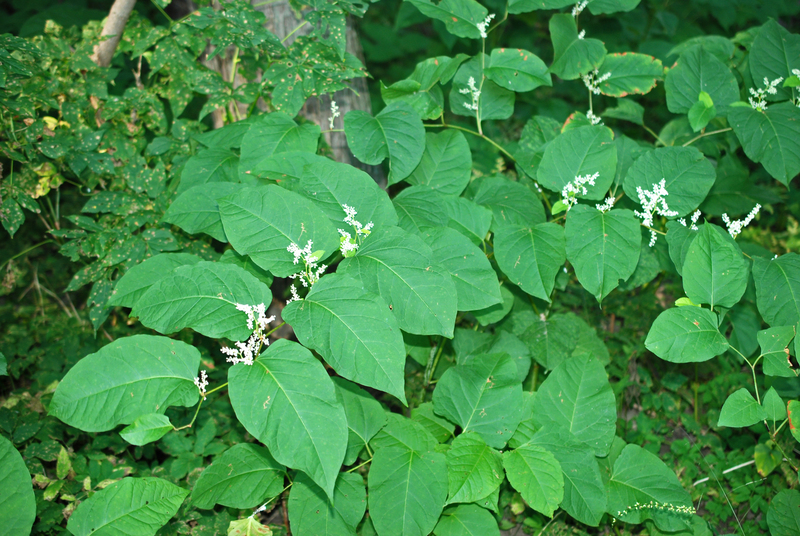 It is similar to Japanese knotweed but its features are larger in size. Flower Description: Flowers are white with a greenish tint and are in small clusters (panicles) in the leaf axils mainly on the upper portions of the stems. Leaf Description: Leaves are alternate, very large and heart shaped. They are often more than a foot long and 2/3 as wide. Stem Description: Stems are hollow, jointed and swollen at the nodes. Fruit/Seed Description: The seed structure is a 3-sided achene that is shiny and brown-black. It creates dense colonies that exclude native vegetation and greatly alter natural ecosystems. Established populations are extremely persistent and difficult to eradicate, even very small fragments can form new plants.